Lake with Canoe by Diane Castle Babcock. The Roycroft Campus is pleased to welcome Diane Castle Babcock and Marsha Van Vlack back to The Neil and Barbara Chur Family Gallery for a new, joint art exhibit titled Grounded by Nature. In its fifth year of operation, the Chur Family Gallery is located in the Roycroft Power House and offers a venue for artists to showcase their work that is steeped in the tradition of head, heart and hand craftsmanship. Diane Castle Babcock has been a printmaker for 35 years, owned her own picture framing business, worked in galleries and museums, and was a visiting artist with Young Audiences of Rochester. 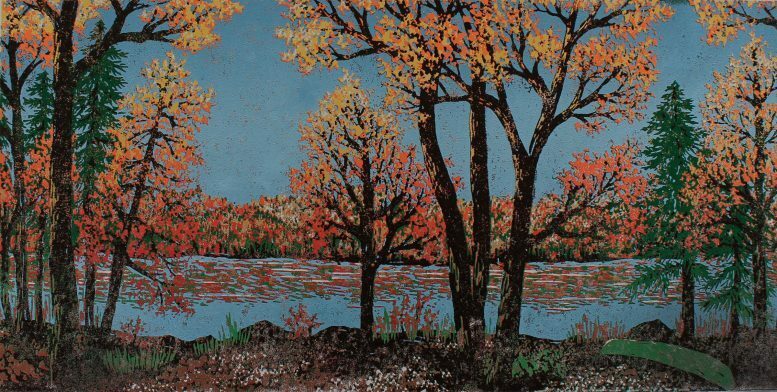 She taught art at Adirondack High School in Boonville, N.Y., retired in 2017, and now devotes much of her time to printmaking. Diane is currently a juried member of the Arts & Craftsman Guild. The Campus will host an opening reception for this exhibit on Saturday, Feb. 23 from 11 a.m. to 3 p.m. This event is free and open to the public; guests will have an opportunity to meet the artists and enjoy light refreshments. The exhibit will remain on display in the Chur Family Gallery through April 19. For further information on this and other events on the Roycroft Campus, please call 655-0261or visit www.roycroftcampuscorp.com. Be the first to comment on "Roycroft Campus welcomes back two artists for joint exhibition"